Perma Latex SBR is based on Styrene Butadiene rubber, and special adhesive and bonding chemicals along with hydrophilic agents. 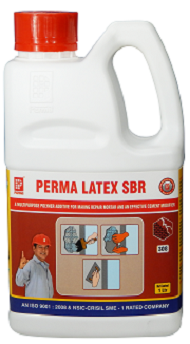 Perma Latex SBR gives a versatile performance in many civil engineering applications. The product is a milky white liquid. Packing : Perma Latex SBR is available in 100mI, 1Litre, 5Litres, 25ltr, 20ltr, 500ltr, 250ltr & 10ltr Litres packing.